These beans are quintessential comfort food and have a fabulous flavour made from few ingredients – mostly inexpensive ones at that. Read the notes at the bottom of the recipe for more information and tips. 1 Cover beans in cold water and soak for several hours. Drain and tip into a saucepan. Cover generously with fresh cold water, bring to the boil, remove any scum, then lower heat and cover with a lid. Cook gently for 1 hour, then drain, reserving cooking water. Transfer beans to a large heavy-based casserole. 2 Blend brown sugar, mustard and onions and spoon over beans. Stir well and grind on plenty of black pepper. Pour on enough reserved bean cooking water to just cover beans. 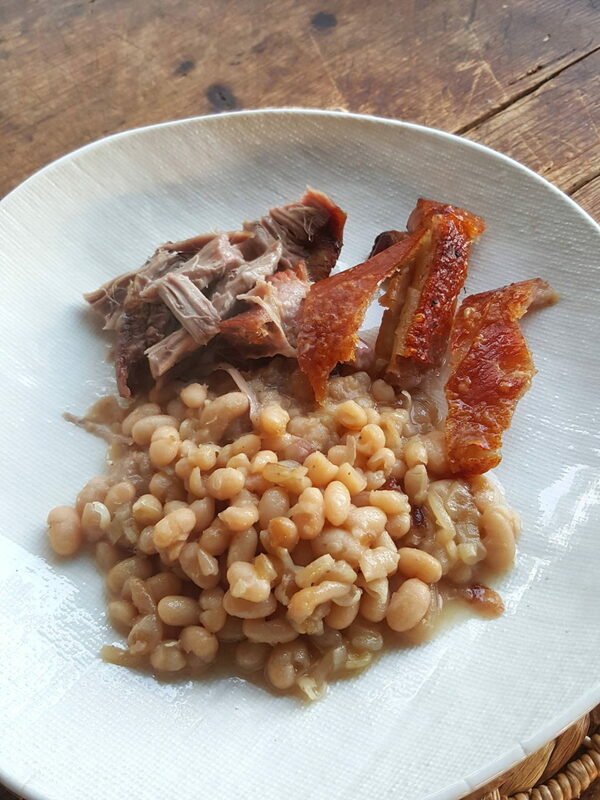 3 Bury bacon bones in beans and put pork belly on top, then push it under beans so that only the skin is showing. 4 Cover casserole with a lid and transfer to the centre of a cold oven. Turn heat to 170°C (325°F) and cook for 3 hours, checking and adding a little more bean water from time to time, if necessary. Remove lid, increase oven temperature to 220°C (425°F) and cook for about 45 minutes, until pork is crackled, adding a little more bean water to keep beans moist if necessary; do not pour the water over the crackling. 5 Transfer pork belly to a board, rest it for 5 minutes, then remove crackling and chop up into pieces, and slice or shred the pork. Remove bacon bones carefully (try to avoid the bacon bones falling apart into small pieces). Dish beans and serve with pork belly and crackling. This dish is traditionally made with molasses which slows down the cooking of the beans, enabling them to be cooked for hours without breaking up, during which time the meat becomes very tender and gives tremendous flavour to the beans. 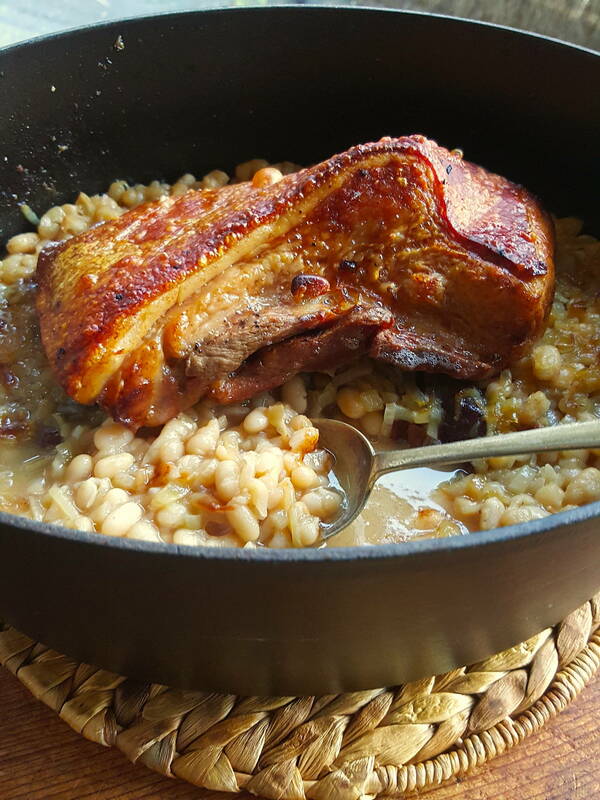 However, I have tinkered with this and use brown sugar and a simple mix of onions and mustard, along with bacon bones which add a delicious layer of smokiness, and pork belly. The beans are a little more sludgy as a result – but unbelievably tasty! And don’t think the beans look too watery in the pic; by the time you carve up the pork belly, they will have absorbed most of the liquid. If liked, serve the beans in soup bowls (and you could add more reserved cooking water towards the end of cooking to keep them liquidy) and accompany with good dark brown bread and chilled beers – choose something dark and smoky. Hello Julie. 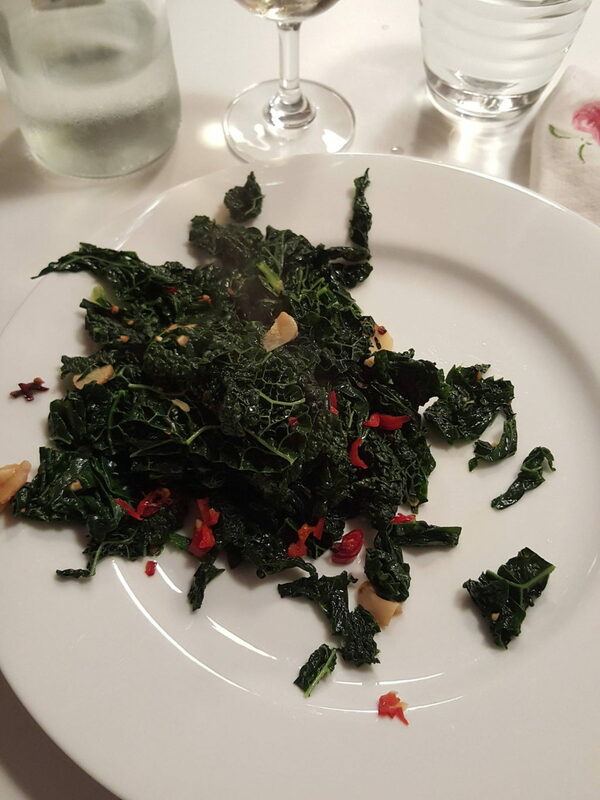 I listened to this recipe on RNZ and am really keen to try it – thank you. I have some molasses which I have been looking for uses for. Would I just add a couple of tablespoons as an extra ingredient, or would this replace something? thanks for your enquiry. You would use molasses in place of the brown sugar. The beans will be firmer, not squishy as my ones in the photo. Soak the beans for a good 12 hours before starting the recipe. And let me know how it turns out! Pork Balls in Lettuce Cups – Mid-week munch up! Looking for something easy enough to do mid-week that packs plenty of flavour? Here you go, pork balls with ginger, lime, lemongrass and a smattering of red chilli. The easiest way to get acquainted with pomegranate molasses is to use it as a drizzle – try it over a tray of roasted vegetables for starters. And just like mint sauce, it gives lamb a fresh zing, but it also adds a fruity note. Crunchy crackling is a gift from the gods. Don't think about it as being naughty – I mean, how can it be when it gives you so much pleasure!